Well, there are a few guides to Lucifer. But, most of them suggest the tanker build and I couldn't find one which showed the potential of Doom, which is probably the best ultimate in the game, with the upgrade of Aghanim's Scepter. Hence, this attempt at writing a guide. Doom Bringer is one of the few strength heroes which can be played as a pure tank or as a pure spellcaster. This guide is focussed on the spellcaster build for doom. When to play doom as a tank is intuitive; you have a couple of spellcasters/mages, another couple of late gamer agility heroes, but no real tank in the team. Now, we come to when should you play doom as a spellcaster. Play doom as a spellcaster only when you have another strength hero in the team who can tank as effectively (i.e. : when the responsibility to tank is not on you); and also when you don't have intelligent heroes to spam spells. A good example of such a team would be when you have a Razor, a silencer/harbinger, a Tidehunter/Treant/Centaur and a semi carry like mirana/medusa. Spellcaster doom is a great counter to heroes with autocasts like harbinger, silencer, enchantress, viper, bone, drow and also against mages/disablers/agi casters as doom is a 12/14/16 second silence and stops all their autocasts/nukes/disables. As we can see, Doom has an extremely high strength gain. Although, the agi growth is less and hence the armor. another point to be noted is that although, doom has a decent enough intelligence gain to cast his spells while tanking, it is not enough to repeatedly spam spells. Hence, to play doom as a spellcaster, intelligence/mana regeneration items are necessary. 1. Late game natural tank even without strength items. 2. Learn LVL death deals insane damage for a nuke early-mid game... and its spammable!!! 4. Pawns with his spells even late game. Swallows an enemy unit for a short period of time, digesting it and dealing 20 damage per second. Each level decreases the cooldown and mana cost and gives bonus gold when the devoured unit is killed. Level 1 - Gives 10 bonus gold, can only devour enemy creeps or non-ancient neutral creeps that are no higher than level 1. Level 2 - Gives 20 bonus gold, can only devour enemy creeps or non-ancient neutral creeps that are no higher than level 2. Level 3 - Gives 30 bonus gold, and can only devour enemy creeps or non-ancient neutral creeps that are no higher than level 4. Level 4 - Gives 40 bonus gold, and can only devour enemy creeps or non-ancient neutral creeps that are no higher than level 6.
note: a must learn skill. this is what gives the edge of fast farming to doom and gets scepter ultra-quick. 1. Using devour on moving creeps may cause it to miss. Blankets the ground in flames, damaging enemies and healing the Doombringer. Also increases Lucy's attack and movement speed. Level 1 - 1 damage/health a second, 10% increased speed. Level 2 - 2 damage/health a second, 15% increased speed. Level 3 - 3 damage/health a second, 20% increased speed. Level 4 - 4 damage/health a second, 30% increased speed. note: Your own ring of health and yasha (with even more MS bonus). Dissipates a piece of a target's soul. Deals 250 bonus damage if the target's level is a multiple of a specific number. Can only cast on enemy heroes. Level 1 - Deals 100 damage, 6 multiplier. Level 2 - Deals 150 damage, 5 multiplier. Level 3 - Deals 200 damage, 4 multiplier. Level 4 - Deals 250 damage, 3 multiplier. note: This is what makes you a spellcaster: A nuke with 500 potential damage and an 8 second cooldown!! The target unit becomes inflicted with Doom. The afflicted unit cannot cast spells (including item spells) and will take damage per second. Level 1 - Deals 40 damage per second for 12 seconds. Level 2 - Deals 60 damage per second for 14 seconds. Level 3 - Deals 80 damage per second for 16 seconds. 1. Devour needs to be maximized out as early as possible; because it gives you gold faster, which you will need in the build I am going to suggest. 2. LVL Death should be invested in so as to maximize the output. e.g. : at LVL 2, the spell deals 400 damage to heroes at lvls which are multiples of 5. when you learn this spell at lvl4, your opponent in the lane will either be at lvl 4 or 5(if he is alone and you have a partner with you), assuming that you are not outlevelled. At lvl 4-5, a spell which deals 400 damage is insane!!!! (especially for agi/int heroes). Plus, it has a damn small cooldown. So, if that opponent does not retreat after the first hit, give him another. That is enough to ensure that he makes a trip to the fountain (or even draw first blood if you are smart). Same reason for learning the spell at lvls 8 and 9... or 7 and 8 if you are outlevelled. A more detailed explanation is in the gameplay section. 3. As to why we get Doom when possible is self explanatory. It is your ultimate; it can give you an almost assured kill every time you use it. So, no point in keeping it for later. 4. 1 lvl of stat at lvl10?? This is very much a personal choice. I prefer stats because level 1 scorched earth is neither going to help you much at escaping nor at chasing. You can get scorched earth if u want (if you ask me, it does not make any difference at all in the spellcaster build, whether you max out scorched earth at lvl 14 or lvl 15). As you are playing spellcaster doom, your job in the team will not be to chase after heroes and finish heroes but rather to spam your spells and help others gank. The IAS is also not really used. As far as using it to escape is concerned, it is entirely up to you to decide. If getting in one level of scorched earth gives you that peace of mind, it is worth investing in it. Choose what makes you feel comfortable while playing, because at the end of the day, it is your comfort level which will be more decisive in the outcome of the game and not just the item/skill build. As we need to spam devour whenever possible and also LVL death to keep to enemy hero on his toes, mana regeneration is required. Let us look at the various ways of addressing early game mana regeneration problems. Not recommended... Problem with doom is not mana pool early. The requirement is mana regeneration so that it is possible to spam devour every wave and yet have enough mana to use lvl death repeatedly around lvl 5-6. Nulls simply don't give that much regeneration. This has a small problem. they dispel on attack. Now, Lucifer is a melee heroes. even to cast devour, you need to go near opposition creeps. this is a contradictory situation. you have to farm and yet cant afford to take even a single hit. Hence, i don't recommend using only clarity potions for mana regeneration. This is a great way of addressing the problem. This is an item made for heroes with lesser intelligence. Instead of adding % based regeneration to the base regen, it gives a fixed addition which is a better option for low intelligence heroes. the regeneration provided is enough to spam devour wherever possible and it also provides armour aura which is good for pushing later. earlier the problem with RoB was that creep waves got pushed too early. However, now, it is possible to change the aura to only hero mode. also, the additional damage is good to ensure last hits. Thus, it is a cheap way to ensure that you kill two birds with the same stone. Another way is to get power treads with intelligence attribute. the + 10 intelligence will address the same problem. However, personally, i feel that the bonus armor from RoB is much better. Another reason why i do not recommend this is that, i plan to rush aghanims by lvl 11-12. If i am to use the +10 int from treads,i have to get treads earlier, which delays my aghanims scepter. Also, as early on in the game, i have neither the additional intelligence nor the regeneration, i cannot use devour to the fullest without being dependent on clarity potions and this slows down the farming even more. This is good for many multiple casters like Ogre Magi, Earthshaker etc. However, this is an overkill on spellcaster doom imo; especially when the core build is aghanims-refresher. After point booster, Lucifer has enough mana pools for a doom and a couple of LVL? Death casts. As for regeneration between 2 ganks, you can use clarity potions along with the RoB. Arcane Ring would have been viable had it been possible to dissemble it. Then, the energy booster and the ring of protection could have been used in aghanims and RoB respectively. Empty Bottle is a good item for a caster/ganker as it regenerates mana and HP quite fast. Also, now, it can be refilled completely by using the runes. Thus, it is a good item for spellcaster doom for solving the mana regeneration problem. However, it doesn't provide the devotion aura which helps a lot in mid game pushes. Nonetheless, it is a good item and can be thought of as a core item for Doom. Get Boots of Speed whenever possible. After Aghanims, we get a perseverance for regeneration as you will be spamming spells left right and center. The perseverance will ensure that you don't have to go back to the fountain for some time. If u are facing harassment, you can get the ring of health after the point booster itself or even before. Remember: always be flexible and make changes according to the situation. Being rigid can hurt at times. However, do not complete the perseverance before aghanims ever. the ring helps in regenerating health and that is required to stay in lanes. But, the voidstone won't be of much help. RoB suffices for that purpose. Getting Perseverance after Aghanims means that you have more intelligence and thus the effect of the mana regen rate is magnified many times. Convert perseverance to Refresher Orb. Do this by lvl 18-20 and your team starts owning in team battles... as you effectively silence and kill two of the opposition spellcasters/disablers. Late Game, get a Heart of tarrasque(5500) to further upgrade your tanking abilities. This is a good damage item which adds to the regeneration and also allows easy farming later in the game. However, it should be procured only after the core build is completed. If you get this early, it will definitely allow you to farm quicker. But it also means that you get the core build too late in the game. Although not bad items per se, they are not really required for spellcaster doom as you are not going to do a lot of physically hitting and you are not the tank in the team anyways to take too much damage. However, if the game does extend even after you have got the core build and HoT, you have two options. Either you stack up gold so that you can buy out when dead; or you can think of converting RoB into Vladmir's as it is a very team based item. However, do this only if your team mates(read tanks) hasn't made any other pushing inventory. Again, this item can be thought of as a part of the core build for tanks. However, getting this after the core aghanims build seems like a waste. Too costly. For spellcaster doom, radiance is best used to farm faster for the core build. However, getting it early means that your core build is delayed. As I mentioned earlier, the build is designed with the aim to optimize your ultimate and hence, we want aghanims as early as possible. Later in the game, it is better off on the tank in your team. Remember, you are not the tank in the team. You are playing spellcaster; and unless you are playing a pub game, you will never have enough gold to complete this as your 6th item. If you do have that much gold, and no one in your team has made this, you can go on to make this. Again too costly to even think of it. you wont be completing this item after your core build ever; and it s not even worth its cost for you. You are the spellcaster. You aren't the person to go after heroes trying to kill them with your physical hits. So, the slow orb isn't made for you. The stats are useless as well (particularly the intelligence and mana pool). Rather let razor make this. OK. This is another team based item which increases your EHP significantly as well. But it is too costly to be your 6th item. You can rather ask your team's tank to make this item. Like, skadi, it is not really made for your role as a spellcaster in the team. Had it been the tank build, i would have included this in the core build. However, if no one is making this, and you really want the extra pushing ability, then you can think of it as a replacement to HoT. In that case, do sell off RoB as it's devotion aura won't stack and the extra mana regeneration will not really be required at that stage. .
Well. You are the primary spellcaster of the team. Thus, this item suits your role well. An added nuke can ensure early kills. The only thing i would suggest is that If you want to get dagon, get it after you complete your core build. The reason is that the benefits provided by Aghanims are far superior to the dagon. Also, you will have made perseverance. Rather than making a dagon at this stage, it is better to go for refresher itself... which basically kills it for dagon. The time when a dagon is most effective is mid game; and in mid game, if you go for dagon, then it delays aghanims. well, that beats the very purpose of this guide and that is to use doom(ulti) at its maximum efficiency. So, it is basically up to you to decide. You can get dagon earlier if you can make up to it and get enough kills to get aghanims quicker. Or, the other option will be to get dagon immediately after aghanims. Aghanims-Refresher-Orchid = quadruple silence... FTW!!! Considering the advantages this item gives, it is remarkably cheap as well... just that, some of the advantages like the added intelligence and the mana regeneration are not really required for Doom even in the spellcaster mode. The sad thing is that if you cast doom on the target which is having soul burn, the silence from soul burn is wasted. This is a debatable point. Power Treads give IAS, extra stats which are good in mid game; BoT gives ability to teleport, which is invaluable late game. Which to choose?? As the spellcaster, you do not need the IAS. However, the stats may seem handy. Also, PT provide the flexibility to balance the stat distribution of the hero. To add to that, the components are all cheap. IN favor of Bot, we have better MS and ability to teleport; both of which are really good for ganking. However, there is the cost of the scroll for which you need to stack up gold. As I do not suggest the use of bracers/nulls, go for Power Treads if you are not comfortable with base stat distribution of Lucy; or if you are not comfortable with stacking gold for the BoT scroll. After all, there is no point in dying a couple of times and delaying everything. However, later in the game, do replace it with BoT as the ability to teleport is far superior late game when you have to push/defend different lanes. If you are relatively comfortable with farming for BoT and surviving/ganking without the extra stats, then go for BoT as they are ultimately more effective. For this, you can even think of buying empty bottle to supplement you instead of the stats from PT. Ask your team mates for the top lane(scourge) or bottom lane(sentinel). Do not go solo as you are melee and can be easily harassed. Preferably have a ranged lane mate. Pretty much like every other melee hero, you stay behind. Go forward once, devour an enemy creep(preferably one at full health) when you get a last hit on the creep(enemy or your own). Ask your lane partner(if he is ranged) to engage the opponent hero. Do it yourself if you do not have a ranged lane mate. What this does is that the enemy creeps automatically focus fire on you and try to attack you. In doing so, they cross the line of your creeps and come towards your side This makes it easier to get last hits without having to cross the creep line and thus minimizing harassment. RoB will give you enough mana regen to spam devour incessantly. Keep the RoB to hero only aura so that you don't push your creeps too far. Deny as many creeps as you can as you do not have to bother about last hitting as much as others. The clarity potion is for the time when you spam LVL Death at your opponent to get an early kill or force your enemy back... Also, ask one of your team mates to share the control for the chicken. This helps as you don't have to buy a separate courier and helps you to get your items whenever you have the required gold. But, do ensure that the chicken doesn't get killed in the process of carrying the items for you. Your team mate wont be so happy to share the chicken with you again... 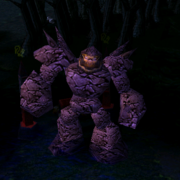 In between waves, go to the neutral camp and use devour on the highest level creep (like chen's creep dominating ability). This ensures quicker earning and experience. By now, you should have boots and soul booster. This is the time to start participating in ganks. Be smart with the use of spells. Try to get kills with doom and LVL? Death. Go on neutral creeping in between ganks. Use devour well now. You can devour the Satyr Hellcaller(lvl 6) which gives you a total of 155 gold. However, remember that when you devour an enemy creep, the enemy still gets the lines of sight of that creep until it dies. Thus, before ganking, DO NOT devour an enemy creep. Rather go for the highest level neutral. The soul booster/aghanims helps you with tanking damage as well. Thus, you don't have to get the strength items early. Also, change the RoB aura from hero only to all. This will allow you to push harder. Keep Farming and get your items. Spam scorched earth so that you can farm better. Also scorched earth will also help you to chase down those fleeing heroes. Remember, cast scorched earth well in front of you while chasing. Take part in team battles and try to kill the agi/int heroes in the opposition. In team battles, doom that hero who is the worst disabler(for you, that is) or the one who has the most annoying ultimate. And use doom to get kills and not just as a deterrent. The use of doom as a deterrent must occur only when you are fleeing and want to survive. Again, scorched earth will help you in your escape. 3. disablers/nukers and spell based agi carry heroes. eg. : Zeus, slayer, rhasta, vol'jin, lion, luna moonfang, Anubarak etc..
thus, you have effectively silenced two of the enemy players and dealt around 1000 exact damage over time. now keep spamming LVL? death, preferably on the heroes your team is focus firing. Go in and use the bonuses offered by the scorched earth and keep physically hitting the enemy heroes. That basically sums up your role as the spellcaster doom. The one advantage that spellcaster doom has over other int/agi spellcasters is that doom has far better survivability as well as that he has insane base damage (at lvl 25, with the attribute bonuses, his base damage is well above 150!!). early-mid game, select the strength attribute if you have survivability issues. If confident about surviving, then select intelligence attribute, so that you have the mana to spam until you complete soul booster. towards late game, it is better to use agility as the attribute as strength and intelligence wont make much of a difference. Also, the 1.6 extra armor definitely helps. Use devour whenever it has cooled down. When you are laning, try to devour the creep with around half health or less. This will ensure that you dont push too forward as well as that the cooldown will be ready when the creep dies, thus increasing the effeciency of using devour. When you do intend to push, get the creep with highest health. thus, your creepwave gets an advantage. Whenever, you are travelling from one lane to another, keep an eye on the neutral creep camps. if you find either of the following creeps (satyr hellcaller, jungle stalker, centaur, furlbog(lvl 5), darktroll), devour them, finish the rest of the camp and move on. 1. You are facing a solo opponent (most probably ranged hero int or agi caster type). When you are lvl 4, he will be at 5 assuming all of you are denying decently. thus, your lvl2 nuke deals 400 damage (300 after reduction). You can use it for spamming in conjunction with your ally's nukes (if he has any) and net a kill. 2. If your ally doesnt have a nuke but is a ranged hero, ask him to continually harass the opponent. Thus, when you get the chance, you can land a couple of hits and a nuke to get a kill. 3. When you are at lvl 6/7 and an opponent is at 8. your nuke deals 450 damage (337.5 after reduction). Usually, by this stage, you should be ganking and thus, should have an ally who can assist. A couple of nukes and doom should ensure kills. This occurs only when you are in a double lane and you are denying superbly or if your ally is a nuker who has sent the opponent back a couple of times. When, You reach lvl5, your opponent will be at 4. Your lvl 3 nuke deals 450 damage. A couple of nukes and hits should be enough to kill any lvl 4 hero. So, instead of maxing out devour, level up this skill.Get your ally's help if needed. This happens again when you are at lvl 7 and your enemy hero is at lvl 6. In such a case, max out LVL Death before Devour. Max out devour ASAP. you can use nuke with the bonus damage at lvl 5, 8 and 9. Thus, keep your mind open and use your skill points as per the situation maxing out your advantage. Read through Great Crusade's guide for the same. There is no guide that explains how to use this skill better than that and I don't even intend to try and better that (if it were possible ). These are useful mid game when you start ganking... their disables ensure that you can cast your spells easily while they keep hammering the enemy. They are good early lane mates as you can combine your nukes with theirs and net early kills. with their slow attacks, you can even gank big time tanks like centaur, leoric, treant. They have spells which magnifies the spell damage dealt to the enemy hero. Stun + maledict + LVL? Death + Doom == GG for the opponent. Although, you may not be playing the spellcaster doom if these guys are in the team. they can disable you for a long time.. that is... a time long enough for their team mates to finish you off. and all you can do is sit and watch... Although, it comes down to the element of surprise. if they disable you before you can react, they will probably kill you. But, if you see them coming, you can doom them and effectively foil their gank. Thus, warding is an effective counter to them. To the tanker build Doom Bringer, AM would not have been a problem. However, to the spellcaster Doom, AM is a headache. If AM gets Hood of Defiance before spellshield, your lvl3 doom with scepter which is supposed to deal 1600 damage, deals a paltry 456 damage that too over 16 seconds (=28.5 effective dps) thus, completely wasting your scepter. LVL? Death causes a maximum of 142 damage!!! The only plus point is that when doomed, he can not blink away, nor can he cast his ultimate. These buggers can save those heroes who are "Doomed" and thus take away your well deserved kills. Dont ever bother to Doom him. It will be dispelled due to kraken shield. 1st.plz update that 6.59d(or newer versions with changes on Lucy)(i dunno c is same anot) juz now i juz used Lucy..
2nd.nice guide...can i get Guinsoo/Eul Scepter/Necronomicon after core items? wow...it's so hard to follow this guide but thank you..i learn..! tnx.,.,. for your nice Idea..! !